I like to think that this boat is the sort of hull that the shed in the mid distance was made from - but perhaps I'm being fanciful. P.S. This is one of those images that is sharper when viewed in the Lightbox. 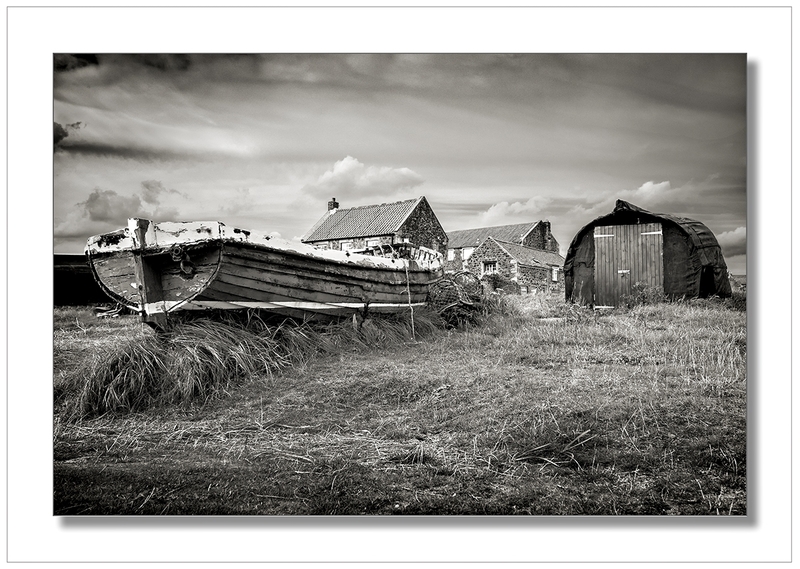 A very nice mono conversion, I've never been to Lindisfarne, though I did go to Berwick Upon Tweed a few years back. Intrigued by this as I am quite certain this setting was used in the TV detective series 'Vera' in the last two or three years. ...apart from that it is a great image John, something about old boats that..floats my boat ! It is noticeably sharper, isn't it? I wonder why. That’s a really well crafted mono John ... and the composition lends a lot of balance to the tones ..
You have managed to avoid the...Cliche trap....look that far too many photographers fall in to....your choice of background and angle of shooting have ensured that. I'd have thought that the background houses would spoil the image, but they don't - they add to it. Nice composition, well seen and converted. WereBo, it is a common practice in that part of the world. The beach area is littered them and the area is well known for them. I think I recall Vera nosing around there as well Denis. Hatter, It's a mystery to me because it doesn't seem to apply to all images. I haven't found out what image property causes it to apply. It doesn't seem to be the degree to which the image size has been reduced from the original before posting for instance. Heck Chrissy, the only thing that gets me out of bed for sunrise is if the bed in the billet is uncomfortable. Lets see the results. After that effort, they deserve to be admired. Nice one John - and I agree that the buildings in the background add, and do not detract from the picture as a whole.